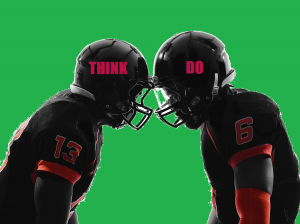 The Workplace Clash Between Problem Solvers and Critical Thinkers: a Battle Between Too Much and Too Little? A close read of some recent thinking about critical thinking reveals a lack of consensus about what it is, how and why it matters, and whether it, as some employers and academics characterize it, amounts to or includes problem solving as the or a core skill. There is one thing about critical thinking, however it is defined, upon which everyone will agree: It is that, in connection with problem solving and for the individual doing it, critical thinking generally takes more time than thinking that is not critical (unless the perfection of practice, i.e., mastery, makes skillful application of it a lightning-fast reflex that is even faster than superficial or clunky thinking–a talent professional critical thinkers not only aspire to, but enjoy being told they have). It may take someone who is not thinking critically longer to solve a problem than someone else who is, but the same person, opting for one approach or the other, will, in general, take longer to think critically about a problem than if (s)he did not. That’s a proposition that seems true under any standard or definition of critical thinking (even if the initial investment in critical thinking will ultimately save time, energy or money as its benefits kick in). Postponing an attempt to frame or itemize the elements of critical thinking and, instead, focusing on what any definition of “critical thinking” must encompass, it is clear that it does include awareness of, sensitivity to and the ability and motivation to avoid and resolve contradictions. Accepting that much, it is easy to illustrate a common workplace conflict between problem solving and critical thinking—in this instance, with an example drawn from my own work experience. A long time ago, I was hired as a programmer analyst trainee with a global insurance company, which was creating its own instructional texts, apparently not edited by an external reviewer. What happened was that a conflict between my critical thinking inclinations and standards collided with the company’s text standards and concept of “problem solving”–mostly because we disagreed about what constituted a problem. The situation was this: In the training manual, I found an important contradiction between information and concepts on one page and its counterpart on another, which, unresolved, made retention and application of that content impossible for me (as a professional logician of sorts—in virtue of my previous graduate training in and teaching of philosophy and critical thinking that makes attempting to work with contradictions unacceptable). To and for me, that was a “problem”. However, management saw things differently—in particular, what counted as a problem. From their perspective, the only problem was that I was spending too much time on such logical details, instead of getting on with the job of finishing the manual and program as quickly as possible. Basically, they valued immediate doing and its ostensible “results” more than any clarity and consistency that might in the end improve those results, prevent confusion and inefficiency, clean up the training materials and overall and eventually make for better doing. In philosophical terms, this head-butting with management escalated into a battle between my Cartesianism (“clear and distinct ideas”) and their (misconceived, in my opinion) bottom-line dollar-denominated pragmatism. Thinking about my performance as critically as they were inclined or could afford to, management concluded I was thinking too much, not doing enough, without considering the long-term benefits of having coherent training materials (despite the fact that the contradictions obstructed application of the training by creating confusion about how to apply the concepts and which ones to apply to hands-on programming). In the end, we soon—prematurely, actually–parted ways, because the company’s idea of “critical thinking” was to be critical of critical thinking and to limit the rest to what was judged by them to be critically important to “problem solving”, itself equated with minimizing the up-front time, thinking and money devoted to to any task, including problem solving. From a critical thinking standpoint, the problem with their approach was its short-sightedness, much like failing to see that dealing with a risky leak in a boat by rowing faster will fail once far enough or long enough out to sea. Another metaphor for that kind of visual impairment is mistaking a leak in a boat for a scratch on it, upon peering at it. Predictably, they would probably reply that “one boat’s serious leak is another’s insignificant scratch”, and agree that neither of us would ever get on board the other’s boat. 2. critical thinking should take a back seat to problem solving or vice versa. Of course, even if results-oriented, cash-or-time-strapped management does not dispute the wisdom of these and other guidelines, it will always be happy to categorize as much thinking as possible as TMT in accordance with them and argue as vigorously as possible that one or more of these guidelines covers any given specific case of thinking at the expense of “problem solving” and immediate (as opposed to eventual) doing. If that happens to you, there is one recourse, one counter to their arguments. Thinking critically and clearly about the distinct possibility of having to look for another job.